DENVER -- A well-pitched, crisp game by the starters suddenly turned into a late-inning slugfest. "It changed pretty quick," said Dodgers infielder Manny Machado, who was making his first foray into Coors Field. "We're holding out hope it's not too serious," Dodgers manager Dave Roberts said. "Finally playing here, you can see why the games go like that," said Machado, who recorded his 1,000th career hit with a single in the sixth. Taylor lined the first pitch he saw from Davis (1-6) -- a knuckle-curve -- into the left-center bleachers to make it 6-5. Two batters later, Dozier followed with a two-run shot to cap off another late-inning, flip-flopping game at Coors Field. "We even said it this morning, try to get to the bullpen as quick as possible," Machado said. "All these guys have been through tough losses before," Rockies manager Bud Black said. "This group has great resolve." "When you think about our bullpen and their bullpen, both have really good names," Stripling said. "Guys you expect to go out and keep it a low-scoring game. That's what this park does. If you make a mistake, guys can make you pay for it." Dodgers: Roberts will meet with LHP Hyun-Jin Ryu (groin) to map out his next step. Ryu may make one more rehab start. "I know he's champing at the bit to get back in the rotation, get back online," Roberts said. ... LHP Julio Urias (shoulder) will throw two innings at Class A Rancho Cucamonga on Friday. ... LHP Alex Wood (adductor) is slated to join the rotation next week. 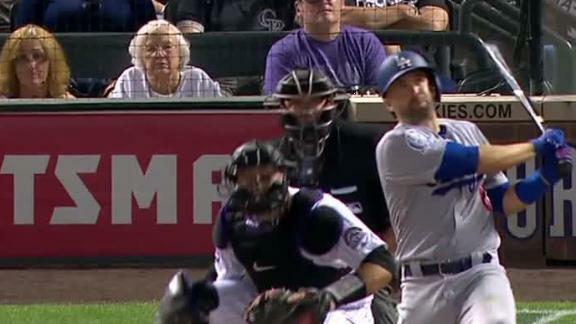 Chris Taylor hits a solo homer and Brian Dozier adds a two-run shot to send the Dodgers to an 8-5 win.